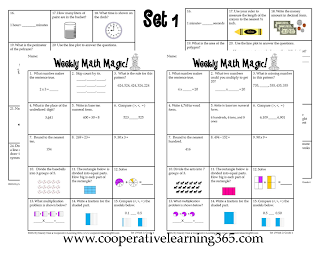 I recently finished Fourth Grade Math Magic. 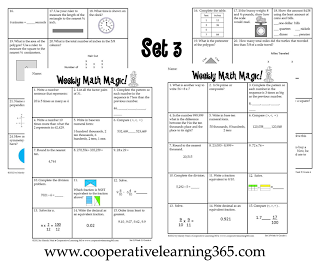 Math Magic is a collection of math printables that introduce new skills, provide review, and extend upon skills within the Mathematics Common Core Standards. Each week contains 25 questions that are provided in the same format and sequence. 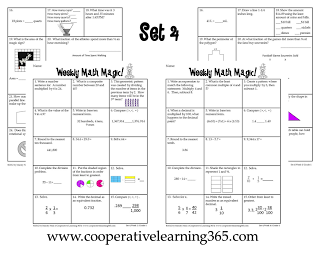 Fourth Grade Weekly Math Magic covers all 4th grade Common Core Math Standards. 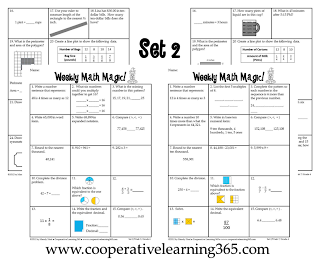 Depending on the needs of your students these weekly printables could be used in 3rd grade as well as 5th. There are four sets available. Each set includes nine weeks worth of practice with corresponding answer keys. From experience, I highly recommend implementing a spiral review for Math whether you find Math Magic to be your answer or another type of review. I think the consistency and repetition plays a huge role in each students’ success with mathematics. For today October 3, all four sets of Fourth Grade Math Magic are 20% off in my TpT store. To get the best value you will also find all four sets bundled at a discounted price. To be taken to a specific set, click the images below.